This page is the start of the angiosperms or flowering plants, which comprise the bulk of this guide. It starts with the order Nymphaeales and continues with the three orders of the Magnoliidae that are found in New York. The order Nymphaeales contains the aquatic flowering plant families Hydatellaceae, Cabombaceae, and Nymphaeaceae. Only the latter two have taxa found outside of cultivation in New York. Aside from Amborella, a shrub endemic to New Caledonia, the Nymphaeales are considered to be the oldest lineage of angiosperms. Most estimates put the age of the Nymphaeales at well over 100 million years. ↑ P.F. Stevens, (2001-2015). Angiosperm Phylogeny Website. Version 14, April 2015. Two Cabombaceae (water-shield family) species are found in New York. One, Cabomba caroliniana, is rare in most of the state but has the potential to be a highly invasive exotic plant. The only extant species of Brasenia (B. schreberi) is native to New York, as well as much of the rest of the world. 1862. Cabomba peltata F.Muell. nom. illeg. Although native to the southeastern United States, Cabomba caroliniana (Carolina fanwort) is considered to be an alien invasive plant in the Northwest and Northeast, including New York, where it is listed as highly invasive. 1830. C. pinnata (Pursh) Schult.& Schult.f. 1841. Nectris caroliniana (A. Gray) Steud. ↑ New York non-native plant invasiveness assessment – Cabomba caroliniana: High (72). Six Nymphaeaceae (water-lily family) taxa in two genera are found in New York. All are native to the region and appear to be fairly secure. ssp. tuberosa (Paine) Wiersma & Hellq. The Magnoliaceae (magnolia family) has traditionally been separated into the two subfamilies Magnolioideae and Liriodendroideae. Magnolioideae contained a number of genera including Magnolia s.s., the largest genus. Liriodendroideae contained the single genus Liriodendron. Phylogenetic research has shown Magnolia s.s. to be non-monophyletic. Therefore it was suggested that rather than breaking Magnolia into numerous new genera, all other genera in Magnolioideae would be placed in Magnolia s.l. to create a single monophyletic genus. This leaves the two subfamilies with one genus apiece, making Magnoliaceae subfamilies redundant. So, they are not used here. ↑ Richard B. Figlar (2012). "A Brief Taxonomic History of Magnolia." Magnolia Society International. ↑ P.F. Stevens, (2001-2015). "Magnoliales." Angiosperm Phylogeny Website. University of Missouri, St Louis, and Missouri Botanical Garden. Version 14, April 2015. 1753. Magnolia virginiana var. acuminata L.
1759. Magnolia acuminata (L.) L.
1886. M. acuminata var. cordata (Michx.) Sarg. ↑ New York Natural Heritage Program. 2016. Online Conservation Guide for Magnolia virginiana. Endangered, S1/G5. Liriodendron consists of two species: Liriodendron tulipifera (tulip tree) from eastern North America and Liriodendron chinense from southeast Asia. The lumber of the tulip tree has similar properties to poplar (Populus) species, so it is often marketed as "tulip poplar" or "yellow poplar," even though tulip and poplar trees are not closely related. The Annonaceae (custard apple family) is the largest family of the Magnoliales, but contains primarily tropical plants. Only one of its more than 2000 species has been discovered growing outside of cultivation in New York. 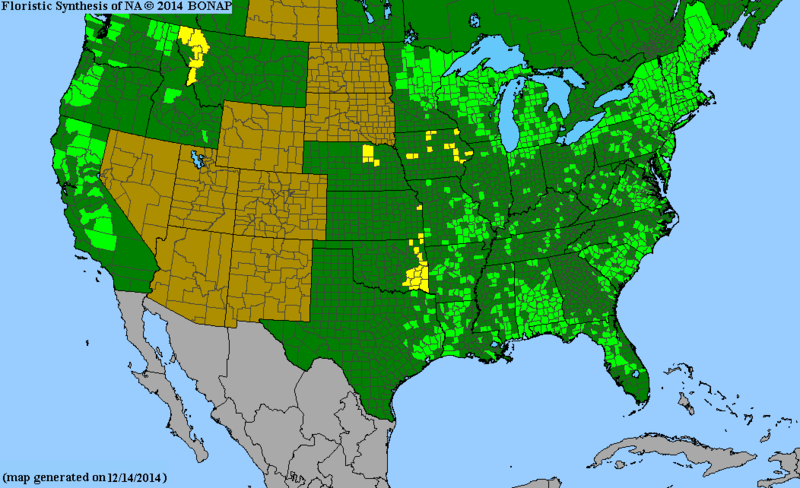 Native range of Asimina triloba. Asimina or pawpaw is a genus of small trees or shrubs that are native to eastern North America. Of these, only the most common species (Asimina triloba) is thought to be native as far north as New York. Though its native range only reaches into the western part of the state, common pawpaw trees can persist where cultivated in other parts of the state and may naturalize in clonal thickets. Pawpaw is considered to be the largest edible native North American fruit (in the culinary sense). ↑ Snake C. Jones and Desmond R. Layne, "Pawpaw Description and Nutritional Information," Kentucky State University Cooperative Extension Program. 1806. Porcelia triloba (L.) Pers. The Calycanthaceae (strawberry-shrub or sweet-shrub family) contains only three small genera worldwide, only one of which is native to North America. Calycanthus (sweet-shrub) is endemic to North America and contains about two to four species. Of these, only Calycanthus floridus is found outside of cultivation in New York, but it is thought to have been introduced from farther south. Though naturalization in New York is rare, it can become established and persist in wooded understories. The Lauraceae (laurel family) contains only two species, spicebush and sasafrass, that are native to the State of New York. The genus Lindera is primarily native to eastern Asia. 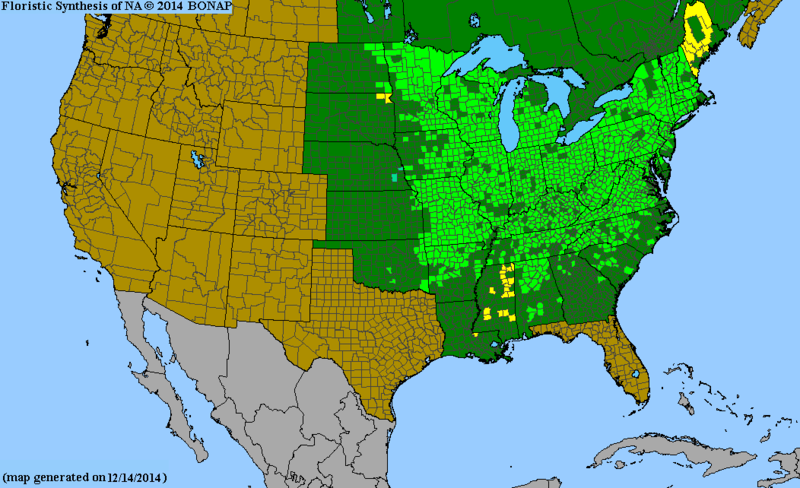 Of its nearly 100 species, only three (northern, southern, and bog spicebush) are native to eastern North America. 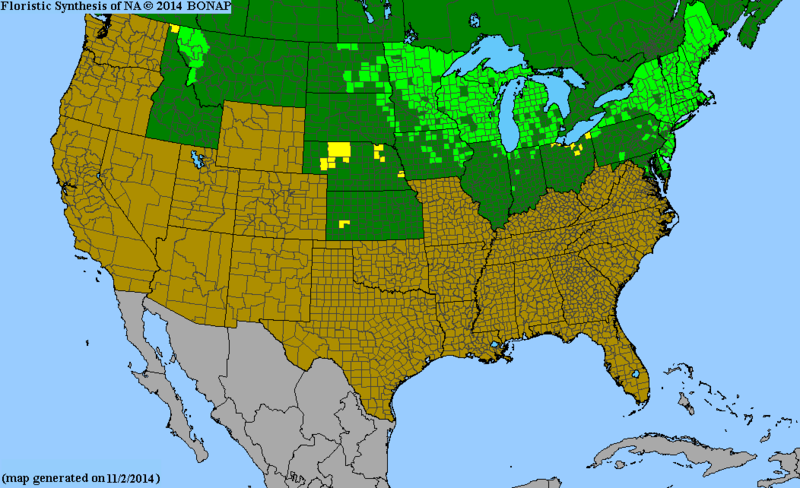 And of those three species, only northern spicebush (Lindera benzoin), is native as far north as New York. 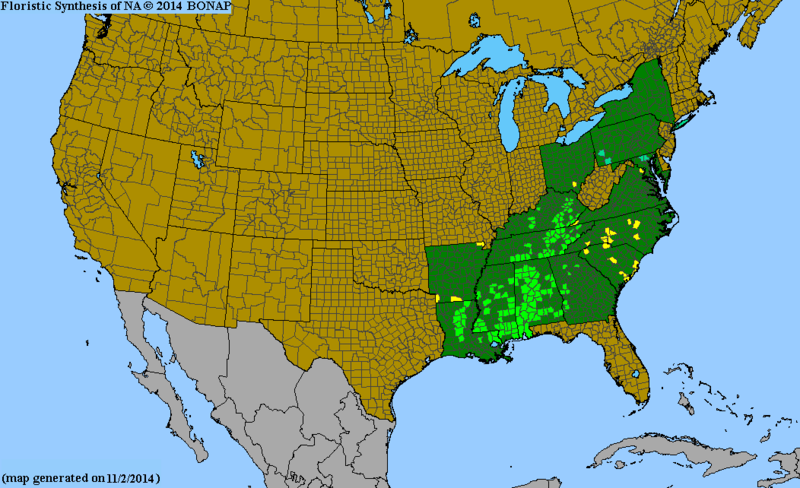 Sassafras has only three extant species. Two are native to eastern Asia, and one, Sassafras albidum, is native to much of eastern North Americam including New York. 1831. Sassafras officinale Nees & C.H.Eberm. A specimen of the avocado plant (Persea americana) was collected from a composte pile in Orange County in 1996. As this subtropical species would not be able to naturalize in New York, placing it in the New York Flora was probably an error. 1825. Persea borbonia (L.) Spreng. 1838. Tamala borbonia (L.) Raf. Although wild ginger (Asarum canadense) has some similarities to Zingiber officinale (true ginger), it is at least somewhat toxic and is not appropriate for use as a food additive. 1898. Asarum shuttleworthii Britten & Baker f.
1828. Endodeca serpentaria (L.) Raf. 1836. Pistolochia serpentaria (L.) Raf. ↑ New York Natural Heritage Program. 2016. Online Conservation Guide for Endodeca serpentaria. Endangered, S2/G4. ↑ The New York Flora Atlas segregates Isotrema macrophyllum, Isotrema tomentosum, and Endodeca serpentaria from Aristolochia into Isotrema and Endodeca, respectively, while other sources, as of yet, have left them in Aristolochia. ↑ a b The New York Flora Atlas segregates Isotrema macrophyllum, Isotrema tomentosum, and Endodeca serpentaria from Aristolochia into Isotrema and Endodeca, respectively, while other sources, as of yet, have left them in Aristolochia. Members of the genus Aristolochia, Aristolochia clematitis in paricular, have been used as medicinal plants since ancient times, but have been shown to be both carcinogenic and toxic to the kidneys. ↑ FNA states that Aristolochia clematitis "probably does not persist" when it occasionally escapes cultivation, but NYFA states that, although a rare weed, it is "quite aggressive at least at some sites, when naturalized." 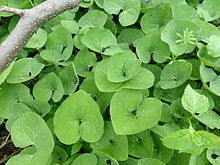 ↑ "Asarabacca" is isted as a common name for Aristolochia clematitis by FNA and Tropicos, but Asarabacca is also a common name for Asarum europaeum (Eropean wild ginger). The Saururaceae (lizard's tail family) world-wide contains only about seven species in four genera. Two of these plants are native to North America, and one is native to New York. The other North American family member (Anemopsis californica) is a southwestern native. The genus Saururus contains only the two lizard's tail plants Saururus cernuus (native to eastern North America) and Saururus chinensis (native to eastern Asia). Only the North American plant has been found outside of cultivation in North America.